1. 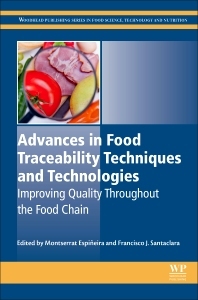 What Is Food Traceability? 3. Where Do Elements Come From? 2. How Can We Track and Monitor in Real Time? Montserrat Espiñeira studied essential and health biology and she completed her PhD in the University of Vigo. Her research works are focused in molecular biology: species identification, population studies, pathogen identification and detection, allergens, epigenetic studies. Since 2004, she has worked in ANFACO-CECOPESCA, a national scope private Technological Center, globally recognized, with more than 60 years giving technological and R&D services to companies of fish products transformation sector, aquaculture and similar companies. She manages the Molecular Biology Specialized Unit, the only laboratory accredited by ENAC with a List of Assays under accreditation (LEBA) for species identification. Moreover she is the responsible for the Life Sources, Aquaculture and managing its Traceability Division. Her latest research in this field is focused on molecular tools developed for control and prevention of several pathologies linked to fish farming and traceability control in alimentary sector. Francisco J. Santaclara studied Biological Sciences in the Vigo University in 1998-2002. In 2008 he obtained the PhD in the same university. His research works are focused in fish and land animal species identification, pathogen identification and detection, allergens, all of them using molecular techniques based on DNA study. He worked in the National Association of Sea and Fish Canned Food Producers- National Technical Center for Fishing Products) in the period 2003-2008, where he was the person in charge of the Molecular Biology and Biotechnology Unit. In the period 2010-2013 worked as researcher in the Food Biochemistry Group of the Institute of Marine Research belonging to the Spanish National Research Council.